Let's talk about composting 101...it's just about Spring and many of us are thinking about our gardens, designing, what to grow and the thought of wonderful vegetables to enjoy throughout the summer. 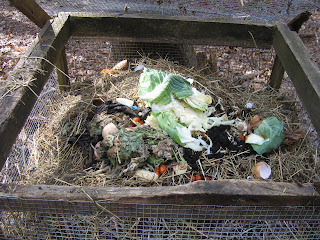 A compost bin is very simple to design as you can see mine in this picture. It was made from an old cage I had with a top on it. You can make a compost bin from old skids, hay bales, buy a professional one or just start a pile. This time of year is great to get started as we clean up our yards, old leaves that are already rotting, food scraps, egg shells, coffee grounds, banana peels, just about anything organic will do. Remember never meat! That can make the compost unhealthy and the worms that are sure to come up from the ground (to make your compost even more awesome) can get sick from it. Turn your compost periodically for great results. There are tons of info on the web on how to design a compost and the proper things that can go in it. I promise, you will have an awesome garden with great results when using compost!